The fee for a chapel wedding, or beach wedding, or renewal of marriage vows is $1250. $250 of this amount represents a non-refundable deposit which must be received by the Chapel By The Sea Treasurer before your date and time can be considered confirmed. The $1,000. remainder of this fee must be received by the Chapel Treasurer two weeks prior to the date of your service. The fee covers use of the Chapel By The Sea facilities during a two-hour window of time, one hour prior to the service and one hour immediately afterward. There is no additional charge for the use of the Chapel By The Sea for a rehearsal, use of the adjoining beach for photographs, and the use of a small, air-conditioned dressing area/restroom which is located immediately adjacent to the chapel. We pray this day be memorable for you, as our Lord Blesses this special time in your life. Only the Chapel By The Sea minister may perform weddings in our chapel or on our beach. If you wish to ask a guest minister to assist in the ceremony, permission must be obtained from the Chapel By The Sea minister. The total fee for a service conducted at the Chapel By The Sea, as described above, remains the same. Any honorarium for an assisting guest minister will be additional and is the responsibility of the wedding couple. If you wish to have our talented Chapel By The Sea organist provide music for your wedding, there is an additional fee of $250. payable directly to the organist. The Chapel By The Sea organist, Lynne Dugan, is also our Music Director. Lynne looks forward to working with you and you may contact her directly at DuganBL@comcast.net to discuss musical selections. If you plan, instead, to have an organist of your own choice, that person will need to be approved by the Chapel By The Sea organist. Professional musicians and vocalists may be employed directly by the wedding couple. 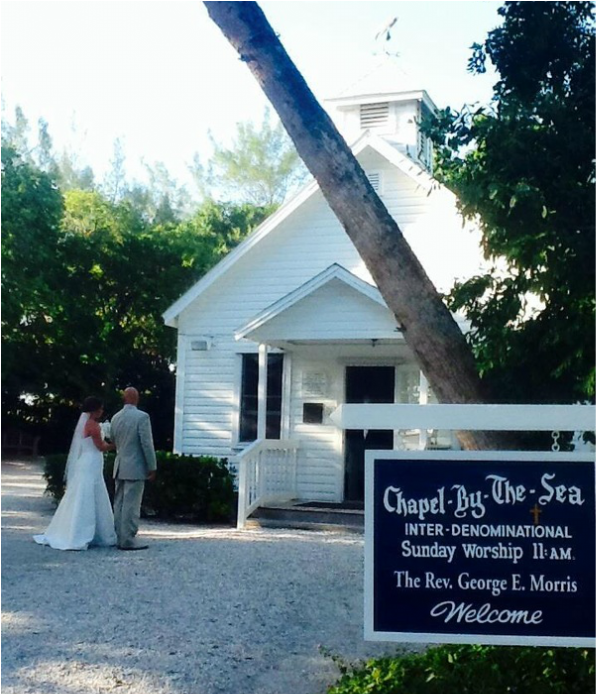 The Chapel By The Sea Board of Associates requires the minister to conduct, as a minimum, an informal one-hour meeting with each wedding couple prior to the wedding. Our intent is to be sure that any wedding at the Chapel is one in which there is an appropriate, shared understanding of the nature of marriage and that the Minister can establish a personal relationship with the couple. Couples should arrange time for such a dialogue to occur well ahead of the wedding date. The Chapel By The Sea seats a maximum of 120 people. Parking is limited. Our adjoining, shared parking lot has a very limited capacity and there is no parking on Captiva's streets. If more than 20 cars are expected, we ask you have a person designated to assist your guests in parking either on the side, or behind the chapel; where we can allow a maximum of ten cars, usually reserved for the wedding party. We encourage car-pooling and the use of hotel transportation. Trolleys and/or buses should not park in the parking lot or within our historic churchyard: however they may drop off and pick up your guests on close-by Chapin Lane & Wiles Drive. The wedding party is responsible for clean-up and removal of all decorations, no later than two-and-a-half hours after use of the chapel. The Chapel By The Sea minister will provide you with the Order of Service used in the marriage ceremony. There is opportunity within the service for some personal preferences made in consultation with the chapel minister. We wish you all God’s blessings on your life together !